While the first film was better, Avengers: Age of Ultron offers more of what Marvel fans have come to expect – great heroes, great villains, action, humor, and hints of a bigger superhero world. After the events of Captain America: The Winter Soldier,, the Avengers re-form to hunt down the remnants of Hydra as well as track down the missing scepter of Loki. The trail leads them to the Eastern European country of Sokovia, where they corner Baron Strucker and his troops. But Strucker has a new surprise in store for them – Quicksilver and the Scarlet Witch. Hydra has been experimenting with giving normal humans extraordinary powers and these twins with a grudge against Tony Stark are their first success. Quicksilver uses super-speed to take out the Avengers, but the Scarlet Witch manipulates their minds to make their worst fears and doubts come true. This has a profound effect on Tony Stark as his fear of an alien invasion is fully realized by the Witch’s powers. After defeating Hydra, this revelation drives Tony to build an artificial intelligence to help the Avengers defend the world. Unfortunately, things don’t go quite according to plan and Ultron is born. “Avengers: Age of Ultron” is rated PG-13 for intense sequences of sci-fi action, violence and destruction, and for some suggestive comments. With this 11th film in the Marvel movie series, fans have come to expect a few things in the films. First off, there’s spectacular action. Avengers: Age of Ultron delivers that. Most notable is an amazing battle between Hulk and Iron Man’s Hulkbuster armor (called “Veronica” here). We’re treated to a titanic battle unlike any seen before in the Marvel movies. We also get to see the Avengers working as a well-oiled machine. Each of the heroes team up for “Power Moves” which would make the Teen Titans proud. Thor and Cap combine their hammer and shield to take out dozens of troops in a single blow. Iron Man teams up with War Machine for aerial destruction. Black Widow teams with Hawkeye for some amazing mid-air mayhem. The result is a lot of impressive action moments that, if you blink, you might miss. Marvel fans also expect the witty dialogue and character-building moments that Joss Whedon is known for, and he delivers there as well. One of the more notable scenes in the film is the party scene we saw in the trailers. Avengers Tower is filled with Tony Stark’s entourage of beautiful women mixed with Steve Rogers’ circle of elderly WWII veteran friends. It beautifully paints the dynamic of the group. Then, when they all take turns trying to lift Thor’s hammer, we’re further treated to fun little character moments that paint a deeper picture of the team’s personality. The quiet moments in the film also take the time to further develop a better picture of the past of Black Widow and Hawkeye. They’re usually relegated to supporting character roles in the other films, but we learn more about them in this movie than any of the other leads. The other thing we’ve come to expect with these movies is a little more of the Marvel Universe to be revealed. We get that here in some scenes that briefly mention the African nation of Wakanda and a brief scene featuring Andy Serkis as Ulysses Klaw. This sets up the upcoming “Black Panther” movie. But the bigger reveal is the new character Vision, played by Paul Bettany. He’s a character that has been in the comic for decades, yet probably one of the most difficult characters to pull off in live action (aside from Rocket Raccoon and Groot). Vision wears a yellow cape, looks like an Oompa Loompa, and is robotic, yet from the moment he appears on the screen, you’re intrigued by him. He ultimately seals the deal with the audience by doing something utterly unexpected that makes everyone realize he can be trusted. I won’t spoil it here, but it had the audience laughing and cheering. I look forward to seeing more of him in the future. It also wouldn’t be a Marvel movie without a cool villain, and that comes in the form of the evil robot Ultron, who is voiced by James Spader. He’s an impressive villain who, unlike Skynet, has a sense of humor. After the movie, my 13-year-old son thought that Ultron was too joking and sarcastic, but I liked it. After all, he came from Tony Stark’s programming, so maybe some of his personality is hidden in the lines of code? Spader oozes menace and contempt and it’s fun to see him get pounded on. Finally, fans expect to see a bonus scene during the credits. While there isn’t one at the very end of the credits, there is one in the middle that will make fans happy. Make sure you stick around for it. One of the things I enjoy most about the Marvel movies is talking about them with my kids afterwards. When it was over, my sons started grilling me about the physics of Thor’s hammer, who the Vision was and what was his history, why Daredevil wasn’t in the film, if Spider-Man would ever show up, etc. That makes the entire experience most enjoyable and I look forward to it with the other upcoming Marvel films. As much as I enjoyed Avengers: Age of Ultron, I did feel like it had some issues. One of the advantages of a sequel is that you can hit the ground running without having to give a lot of background on the characters. You can simply dive right into the heart of the story. Joss Whedon does that here, but I felt like it was a little too fast. In fact, much of the story felt rushed. 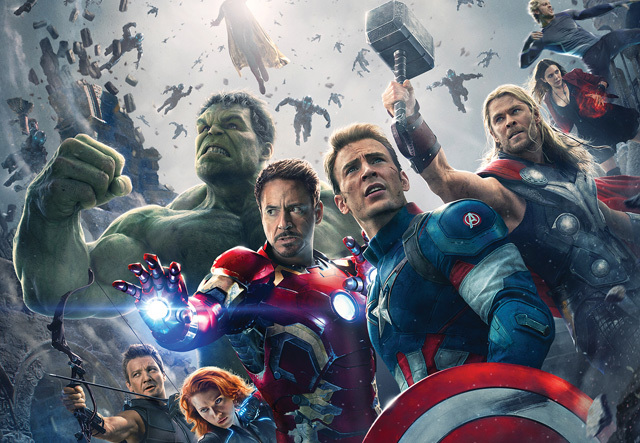 The movie starts out showing all of the Avengers assembled with no explanation of how or why. After all, the last time we saw Iron Man, he had destroyed every single copy of his armor. Now he not only has new armor, but he has built additional robots and has a huge fear of an alien invasion. This movie doesn’t deal with this disconnect. As cool as Ultron is, he also feels rushed. He becomes sentient and is ready to destroy all humanity in the span of about 10 minutes. You don’t really naturally follow his logic. The film also glosses over the fact that Ultron is taking over the world and wreaking havoc, yet we never really see it. We’re just expected to get the idea in a throwaway line from Nick Fury. Other aspects of the film felt really rushed as well. Thor takes a side trip with Erik Selvig that seems to serve minimal purpose. Baron Strucker, a major Marvel villain, is dismissed very quickly. And a romance between Bruce Banner and Natasha Romanoff does not feel natural at all. Whedon tries to give some reason behind the romance, but it doesn’t line up with anything in the previous films. As for the new characters Quicksilver and the Scarlet Witch, they are rather dull. Quicksilver from the X-Men movie was a significantly better character and Bryan Singer did a lot more creative things with his super-speed than they did in Avengers. I was hoping Whedon would up his game after Singer threw down the gauntlet, but it didn’t happen. The Scarlet Witch doesn’t fare much better. Her main purpose seems to be to bring the Avengers’ doubts and fears to the surface. Beyond that, she’s not much of a compelling character. After this movie was over, my 13-year-old son commented that he felt like Avengers: Age of Ultron was similar to the first one. In some respects, he was right. Beat for beat, it followed the formula of its predecessor. A foe appears, the Avengers gather to face it, they fight each other, they are briefly torn apart, then they gather back together in the end to fight the main villain in a huge destructive battle with an army of cannon fodder. Joss Whedon went to great pains to say how a sequel had to blaze a different path from the original, yet there are a lot of similarities anyway. Matters aren’t helped by the fact that the big CGI battle in the finale lacks any of the fun moments that the first film had like Hulk punching Thor, the shawarma comment, etc. Finally, I saw this film in IMAX 3D and I have to say neither of those extras enhanced the movie-going experience. The 3D seems to have been an afterthought and IMAX didn’t seem to be worth any additional cost. The only theater upgrade you need is to see it with a bunch of enthusiastic Marvel fans, and you can get that free of charge. While I thought the first Avengers film was better, I still enjoyed Avengers: Age of Ultron and would recommend seeing it on the big screen. If you’re a fan of any of the previous Marvel movies, it is required viewing. It’s a great kickoff to the 2015 summer movie season.